Sometimes I just need to read something to encourage me as a woman, mother, grandmother, and wife. One of my favorite books to read and re-read is Time Alive by Alexandra Stoddard. As you know she inspired the name of this blog because my dear friend always puts a ribbon in her books when she autographs them. Peeking out of my copy of Time Alive is a bright pink ribbon that matches the delightful pink ink that she used to personalize my book. Her inscription was “Now!” She really didn’t need to say anything else. This one word sums it up for me. I get so busy and think that I need a 36 hour day to complete my tasks. Her inscription made me realize that now is the time to live, love, and laugh. Today, not tomorrow. We have to be patient with ourselves and others. Whether we’re tending our roses or raising a child, when we love life and care deeply, we will be investing our time wisely. In all important matters, there are not shortcuts. When we acknowledge that what we are doing with our time is of lasting value to us and others and we believe that we are doing the right thing, taking the time needed is worth it. I think you will enjoy reading this book and pondering her lovely ideas and thoughts. You can go to to her website www.alexandrastoddard.com to order a copy. What are your favorite inspirational reads? Reader to Reader, Writer in Residence, and Chimes. These actually give me pleasure and inspiration, they are the heartbeat of your magazine. I covet and save all of the issues, pulling them out of various places in my home to reread. wonderful stories which we can enjoy over and over. Books are friends. If they are good- they shouldn’t be thrown away, but visited often .I have at least 9 books by Alexandra Stoddard. Several by Emilie Barnes. I’ll read anything by Debra Prinzing or photographed by Rob Cardillo. My new NIV study Bible- God’s Word for Gardeners- edited by Shelley Cramm for Zondervan- an enjoyable perspective. 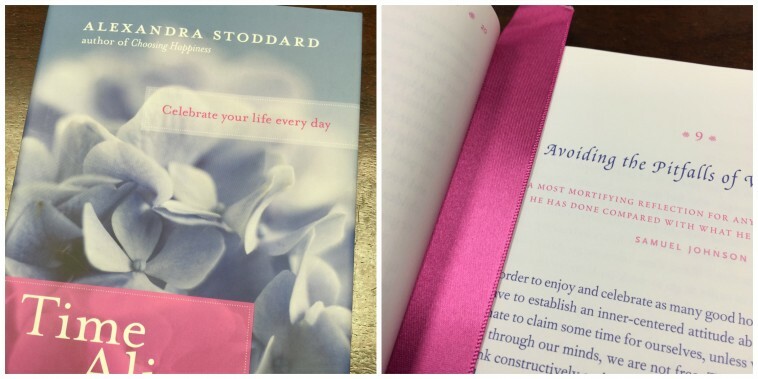 I will definitely look for Alexandra Stoddard’s new book. Thank you for suggesting it and to all the comments with other helpful suggestions. I also re-read the Jan Karon Mitford books when I need to feel comforted that not everything has changed beyond recognition! I just love the whole Father Tim series. I am not so much for intentionally inspirational. I prefer accidentally inspirational. Like Proust. Or Julia Child. Or Laura Ingalls Wilder. Or Carlo Levi. Thank You! Dianne Sharpe & Cynthia Little, Your posts both have lifted my spirit & inspired me this morning. I had started “Jesus Today” by Sarah Young & set it aside for sometime. Because of your post & have been savoring it this morning. Blessings on you for leading me back to it. I am going to make a point of reading out of her other books as well each day again. Yes we need to be investing in positive, uplifting messages. Thank you Cynthia for an awesome idea to add to my life as well. Blessings on you as you continue to uplift others. My day truly was blessed by both of you. Thank you for “Ribbon in My Journal” I so enjoy the website & the magazines. I keep all of mine & go through them over & over. I just finished Alexandra’s wonderful book for couples “Happiness For Two”. Since reading “Creating A Beautiful Home” years ago, I have read it and several of her other books many times. They are my go-to books when I need a lift. She is a lovely inspiration to me and has helped make my life rich. I would love to know her personally. I will be ordering “Time Alive”, and can’t wait to see if there will be a ribbon marking the first page! I read many inspirational books, but I have to say the magazines I read from Hoffman Media bring me the most joy! 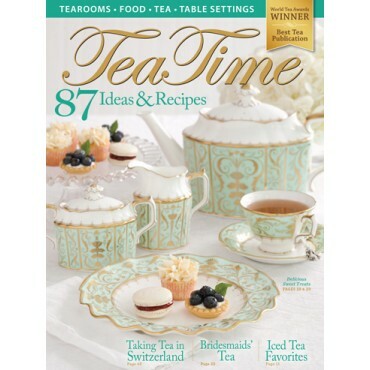 I recently completed your media surveys from Victoria Magazine, Lousianna Cookin’, and my favorite, TeaTime! Too bad it didn’t include space to provide additional comment. One question asked how long it takes to read each magazine! I savor each issue! I read and often reread each magazine cover to cover! I received my first subscription to TeaTime Magazine as a birthday gift and was smitten with utter delight! It was the first time I ever bought back issues of a magazine! I have renewed my subscription many times and now gift my friends with their own subscriptions as well. I have kept all my TeaTime issues to frequently reread them. I was thrilled with your British Issue of TeaTime Magazine which featured my favorite TeaRoom Maids of Honour! I literally shrieked with delight out loud when I saw that article! The other two magazines, I keep favorite recipes and pass the issues on to my hair salon for customers to read while waiting to have their hair done. Thank you for all the joy and inspiration your magazines have provided for me and all the other readers! She is my favorite author. Her blog is very uplifting as well. I have most of her books and reread them on a regular basis. I love Alexandra’s books & have most of them. It is a joy to read them again & again. I have Time Alive on my nightstand right now & read a bit of it each night to wind down before going to sleep. Alexandra is the one who led me to your delightful blog. I simply love Alexandra! Have read all of her books! One of my dear favorites is: The Gift of A Letter. I have read and reread it many times over the years! I am an avid writer of letters to friends and even to strangers that I find in the news. Being a recent widow, I often feel alone and sad. However, when I write a letter and enclose it in one of my handmade cards, I feel so uplifted. I hop all the way to the post office to mail them! It is a 2 mile walk that I take everyday. Having a letter to post makes it all worth while. Cynthia, I enjoyed reading your comment! You sound like a kindred spirit! I also enjoyed The Gift of a Letter and can identify with it because I enjoy sending letters and keeping in touch with people. One of my favorite times to write is around Valentine’s Day. I like for my friends to know that it’s a special occasion to celebrate friendships…and not just a special day for married couples. I know the recipients of your letters must enjoy receiving them. When I need inspiration,I go back and reread Jan Karon’s books from her Mitford series…whether it’s Father Tim, Cynthia, uncle Billy,Miss Sadie, or any of the other wonderful characters in Jan’s novels, I am always comforted, spiritually renewed and most definitely inspired by their words and actions. Love Alexandra’s books…have almost every single one. I display them proudly in the book area of my living room. I ordered Style for Living directly from her and received one of those beautiful ribbons and a wonderful card with a very heartfelt note. She also has a website where she posts a monthly newsletter…in case your readers are interested. Thank you for reminding me to slow down and take time to re-read Time Alive. My life is very busy right now as I prepare for my oldest son getting married in four weeks, my youngest graduating college and then leaving for grad school and my future daughter in law graduating medical school. I often forget to just breathe during a busy day. This will give me a great purpose to stop, sit with a cup of tea and enjoy her great wisdom. Thank you for this. I often get so wrapped up in just completing a task that I fail to be in the moment of life. Sometimes we have to be reminded to slow down. I love Alexandra’s books. I don’t have the one you’re referring to, but I have several others, and I reread them regularly, especially when I’m a bit down and need encouragement!